Wow. This is the last NFL picks post for the season. Next time we'll get to crown a winner. As I mentioned on Facebook and Twitter last week, we will have a playoff contest posted on the blog at the conclusion of this weekend's games. There will be a prize, I promise! Here's our final regular season picks. Next year I hope we get all of our contributors in on the action. So close to the end of the season. Matt and Cody posted matching 10-6 records during Week 15. With two weeks left in the regular season, Cody still holds a seven-game lead on Matt. Happy Holidays to all. We'll be back in a more complete capacity after Jan. 11. Wow. It's hard to believe, but tonight's show will be the last of the semester. We've come a long ways in a short amount of time, and we hope you've enjoyed it. As always, listen to us live on WCKS The Whale or here on the blog tonight at 10:05! Hope you can listen in! The NFL gods giveth, and the NFL gods taketh away. A week after Cody's rough weekend set Matt up for an improbable comeback, Matt had a rough weekend of his own (combined with Cody's top-dog performance). First donations come rolling in! We want to thank everyone who responded to our pop can, change and charity donation drive tonight. Every little bit of money raised helps our project and Habitat for Humanity. Currently, we have raised $10.80 for Habitat for Humanity and have come much closer to moving our bottom line out of the red. What a great start to the holiday season! Be sure to tune in Thursday night at 10:05 p.m. for our final show of the semester. Ok, I know my picks are biased based on my love for the Vikings. The predictions look particularly bad because Minnesota is coming off a bad loss against Arizona. But, Antoine Winfield's coming back to secure the secondary, and the Viking's dominating offensive line will be at full strength. Just you watch, The Brett Favre fairy tale will have a happy ending after all. Matt and I are extremely excited to get another show going tonight at 10 p.m. It's our second-to-last show of the semester, so let's break a listener record tonight! We make for an excellent break from studying and go great with a nice warm cup of hot chocolate. 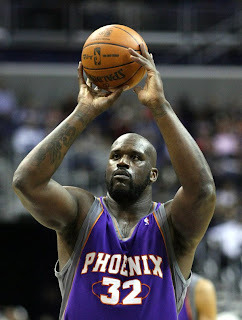 I’m not predicting a third Shaq trade in two years. Instead, Shaq is going to be providing South Beach with a duo of such magnitude you could previously only create it on NBA Live. The Shaq Experiment in Cleveland is a failure. In 2010, LeBron James will be heading south to Miami. Bring on the hate mail and tell me I’m crazy. Better yet, show me some numbers and prove me wrong. I’ve been a critic since I saw the trade come across the bottom line on June 26 and I’m not backing down now. There’s a reason Team USA doesn’t win a gold medal in every single Olympics. There’s a reason the New York Yankees don’t win the World Series every year. There’s a reason the Detroit Pistons knocked off Shaq’s hall-of-fame Lakers in 2004. It’s called chemistry. If you could just grab the best talent and spew it on the court, why would we pay coaches and general managers so much? The Shaq experiment was destined to fail from the start. What makes LeBron James great? It sure isn’t his jump shot (he’s not Kobe Bryant). It’s not his amazing ball skills and quickness (he’s not D-Wade). It is LeBron’s ability to drive to the rim with his 6-foot-8-inch, 250-pound frame. He very well may be better at driving through the lane than anyone in NBA history. He is a freight train in perfect control, able to glide through the air and deliver with such force that shot blockers need not apply. When he begins his drive, you are at his mercy. This isn’t to say LeBron James doesn’t have a good jump shot, or that he doesn’t have exceptional ball handling skills and quickness. But, when you take away his drive you take away his identity. The funny thing is, the only person that has proven, and will continue to prove, able to take away LeBron's greatest strength is his own center, Shaquille O’Neal. Ten years ago, LeBron and Shaq may have made a fantastic pair. But in order to get by Orlando and Boston in the Eastern Conference, the Cavaliers will need more than an aging O'Neal clogging the lane. When Shaq hogs the paint, it forces LeBron to switch to his secondary weapon: his jump shot. It’s like when Ohio State asks Terrelle Pryor to step back and pass too much, you just have to let the kid play. What’s ironic is the Cavaliers were right in grabbing a Phoenix center, they just grabbed the wrong one. Could you imagine a mobile and agile Amare Stoudemire running the pick-and-roll with the King? All this only builds up to the NBA’s shuffle and deal off-season in 2010, when James will reportedly test the free agent market if Cleveland can’t surround him with a cast capable of winning a championship. One of the teams which can afford James is the Miami Heat. There has been plenty of speculation LeBron would love to join his friend and Olympic teammate Dwayne Wade down in Miami. We can only imagine the possibilities. Would the chemistry be there? It sure looked like it was in Beijing during the Olympics. I understand only 20 or so games have been played this season, and much is still to be hashed out. But when everything goes to hell in Cleveland (e.g. they don’t advance past the second round of the playoffs), you heard it here first. ESPN is reporting a three-way trade which, among many things, would send Detroit Tigers center fielder Curtis Granderson to the New York Yankees and land minor league outfield prospect Austin Jackson in Detroit. It's funny how two years time can change a team's direction. Not long ago, it was the Tigers who shipped off prospects (Cameron Maybin, Andrew Miller) for well-established talent (Miguel Cabrera). Now, Detroit finds themselves on the other side, dealing a starter and all-star (Granderson) for up-and-coming talent (Jackson). Losing will take its toll on any organization in any sport. Instead of spending big money to gear up for one more World Series run next season, it appears the Tigers' front office is content to go through another painful rebuilding phase. Granted, Granderson's performance last season was far from perfect. A .249 batting average and .327 OBP is hardly what any team wants from its lead off hitter. But, Granderson plays a solid center field in spacious Comerica Park and is a great member of the community. Defense and community outreach are always overlooked, but are vital to the success of a baseball team. Thankfully, the Tigers may be receiving a right-handed reincarnation of Granderson in Jackson. Although he is still raw, Jackson has progressed steadily through the Yankee's farm system and is considered a top-50 prospect. The 22-year-old was named the International League Rookie of the Year in 2009 as a member of the Scranton/Wilkes-Barre Yankees (AAA). He hit a flat .300 in 504 at bats, and had a .354 OBP. Scouts peg Jackson as an everyday center fielder who is good at many things, but not great at any. He has above-average speed (24 stolen bases in 2009), but lacks power (only 4 home runs in 2009, or 1 per every 126 at bats). Playing in 96 games as a center fielder last season, he had only one error in 209 chances. Jackson could be ready to be an everyday starter as early as next spring, so it will be interesting to see how the Tigers bring him along. Within the past decade, Detroit has been traditionally conservative in how they have handled outfield prospects. 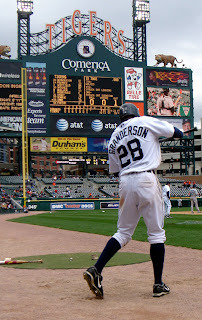 Granderson spent parts of two seasons with the Tigers before becoming the everyday center fielder in 2006. Before being shipped to Florida in the Cabrera deal, Cameron Maybin had spent only 24 games in the majors. In Jackson's case, the Tigers may have to rush as there is little proven talent available to play center field in Motown. Ryan Raburn showed promise with the bat and glove last year, but started only five games in center. Clete Thomas seems to be the most likely opening-day starter, as he filled in for an injured Granderson two seasons ago and has played a substancial amount of center field in the minor leagues. Both Thomas and Raburn played pivotal roles as backups last season behind the aging Magglio Ordonez and oft-injured Carlos Guillen. Those roles will fall to Wilkin Ramirez and Don Kelly should either Thomas or Raburn be thrust into a starting role. Seeing Granderson go will not be easy for many, especially since he is headed to the evil empire that is the Yankees. At the very least, the Tigers picked up an outstanding prospect to replace him. Ouch. A rough weekend for Cody. Matt wins this battle, but Cody still holds the overall lead. The race is heating up as we near the end of the regular season, with Matt only three games behind thanks to Cody's worse record of the season. The news of Jimmy Berezik's second playoff suspension in as many years has begun to make its way around the Allendale campus of Grand Valley State University. Thankfully, when the Lakers face off against Carson-Newman College today in the NCAA Division 2 national semifinal, they will be well prepared to handle the absence of GVSU's all-time leading rusher. In last year's playoff loss to Minnesota-Duluth, Berezik's suspension meant all-purpose back Blake Smolen had to spend the majority of the game in the backfield. Although Smolen racked up 139 yards on 27 carries, his absence on the on edges greatly hurt the offense. This year, P.T. Gates and Justin Sherrod have emerged as legitimate second and third running backs. Gates arguably ran better than Berezik last week in the rematch against Minnesota-Duluth, and he will get his chance to show why he was a Division 1-recruit today against Carson-Newman. Berezik's absence pales in comparison to the hole left by Andre Thomas on the defensive line. Facing a complicated triple-option scheme, it was imperative for an already banged up Lakers defense to be as close to full strength as possible. Now with Thomas, his backup Ryan Wheat and reserve linebacker Blair Hollis all suspended for the rest of the season, GVSU's national championship hopes will fall on a patchwork defense. The Lakers have worked far too hard for a few suspensions to ruin their season. Look for GVSU to punch its tickets to Alabama this afternoon against Carson-Newman. We would like to welcome Bryan Arseneau to The Sunny and C Network. He was the first official applicant to be a contributor on the blog, and he starts his time here with this column. A second season of disgust for the University of Michigan football team has finally come to an end in Ann Arbor, with the Wolverines missing a bowl game for the second straight year. Alleged practice violations have cast a dark shadow over the coaching staff, leaving many to wonder if head coach Rich Rodriguez should be concerned for his job. However, as I watched the Ohio State game which officially ended Michigan’s season, I couldn’t help but feel Rich Rod and his football team were on the right track. Despite two disappointing years, I believe we saw a Michigan team which is only a year removed from being a Big Ten Conference title contender. The youth of the current Wolverine squad gives them a great returning roster. Linebacker Brandon Graham and running back Brandon Minor will be the only two key players lost this offseason. With many returners -- such as Tate Forcier, Michael Shaw and Donovan Warren -- getting more acclimated to the systems of both Rodriguez and defensive coordinator Greg Robinson, next year's team will gain more consistancy. Even though Rich Rod hasn’t posted a great record in his time in Ann Arbor, he has been able to give many underclassmen valuable experience that will help this team take the next step forward. Rodriguez continues to bring in top-10 recruiting classes, constantly improving the abilities of his system. When Rich Rod was brought into Ann Arbor, he was given a team with a severe lack of talent. He has proven in the past to have an extremely proficient attack when he has all of the pieces for his system. Michigan's conference schedule is about as favorable as they could hope for next season -- Michigan State, Iowa, and Wisconsin all travel to the Big House. I realize Michigan has to make road trips to Happy Valley and Columbus, but Penn State will graduate quarterback Daryll Clark, a major part of its offense for the past two seasons. If there ever was a good time to travel to Happy Valley, next year may be as good as any. I still believe in Rich Rodriguez and his ability to build a national championship-contending football team, despite his 8-16 record and two consecutive bowl-less seasons. This years team's made progress from last season, and at times looked like a dominating squad. The biggest improvement needing to be made is consistency. Michigan's offense was able to move the football, finishing fourth in the Big Ten in scoring offense. But, they were a young team that rode the tide of highs and lows. The Wolverines shot themselves in the foot in too many key situations to win the close games this season, but the ability to close out games comes with experience. By playing underclassmen the past two years, Rich Rodriguez has built a foundation of talent and experience for this Wolverine program to build upon. Now, Michigan is ready to take the next step -- a step out of the Big Ten cellar. JT: Will Notre Dame's return to glory be the Brian Kelly story? We would like to welcome Jason Thompson to The Sunny and C Network. JT, as he would like to be known, will be one of our regular contributors. He will also be a guest on tonight's edition of The Sunny and C Show to discuss Notre Dame football. Another no-show last week by the Notre Dame defense against Stanford left everyone with little to speculate regarding the future of coach Charlie Weis. After a five-year tenure (or internship, as some fans will call it), a 6-6 record became unacceptable to the Irish faithful. Quite frankly, Weis only made it to Monday because it would have been politically incorrect for a Catholic university to fire someone on a Sunday. Most of these questions are irrelevant because as coaches like Brian Kelly, Urban Meyer and Nick Saban have shown, the story in college football begins and ends with the head coach. Just about any school can be one hire away from plunging onto the national scene. That being said, who can right the ship in South Bend? Remember, Notre Dame isn’t your typical job. In-state recruits don’t exist, so you had better be a great recruiter. You must be an ace with the media because from the minute you sign up, you will be relentlessly questioned and second guessed. Finally you will need to be one of the “good old boys.” There are a lot of old-fashioned Irish alumni digging deep into their pockets to buyout Weis’ mistake of a contract, so they better like you at face value. With all of that in mind, isn't the search fairly simple? Its a two-tier process consisting of three coaches: Meyer, Kelly, and Bob Stoops. After multiple failures, Swarbrick can’t afford to get cute and look at a Gary Patterson, a Butch Davis or a Jim Harbaugh. They need someone with hardware and a name. Swarbrick owes it to the Irish fan base to throw the kitchen sink at Meyer. They underbid him in 2004 and lost out to Florida. Notre Dame is still close to the heart of Meyer, and if Swarbrick could bring him to South Bend everything in the world would be right again. Likely? No. Meyer has already publicly shot down the idea of ever leaving Florida, even after admitting Notre Dame is his dream job. But then again, Saban did the same thing to Alabama until the pot was sweetened. So Irish nation can dream right? Once Swarbrick fulfills his obligation and forces Urban Meyer to tell him no, it comes down to Stoops and Kelly – pick your order. It took Stoops far too long to dismiss the rumors of him coming to South Bend, and nobody should be shocked if more rumors start surfacing in the coming weeks. Stoops is said to feel underappreciated in Oklahoma, and his midwest-Catholic roots would fit right in at Notre Dame. Kelly, one of our own from Grand Valley, is neck and neck with Stoops. Kelley has had success wherever he has gone, and nobody needs to be reminded of what he has done with average talent in Cincinnati this year. The knocks on Kelly are his unproven track record on the recruiting trail and a lack of Division 1 hardware. But, if he is the second coming of Meyer like some have proclaimed, can Notre Dame afford to pass him up? In addition, all speculation says Kelly will be half way to South Bend before he hangs up the phone with Swarbrick. With loads of excitement and speculation surrounding the Irish football program, don’t be surprised if little noise is leaked out of South Bend in the coming days. All three of the coaches still have bowl games with their current teams, and Notre Dame can’t afford for any of them to pull a Les Miles and bail because word was leaked too early. On paper, two of the three are still in the national title hunt, and, as Miles showed us, no future job can pull a coach away from that. Rumors and controversy will surround not only the Notre Dame football program, but programs around the country as more names are thrown into the Irish coaching mix. We’ve seen these insecurities already, as rumored candidates Jim Harbaugh and Gary Patterson were given large contract extensions by their universities as added insureance. Notre Dame has a huge decision to make in the coming weeks, maybe one of the biggest in school history. Time is of the essence, as recruits grow restless of being committed to a leaderless program. The weather may be cooling down here in Allendale (where we are supposed to get 1-to-3 inches of snow today), but The Sunny and C Show is red hot. We're coming back from our Thanksgiving hiatus with an all-new show segment and great show news. College football correspondent Jason Thompson will be joining us during a portion of tonight's show for a look at what is happening down at Notre Dame now that Charlie Weis has been fired. It's going to be a fun show. Be sure to listen in at The Whale or watch/listen here on the blog. The show will start at about 10:05 p.m.
As a Detroit Tigers fan, I have been following this closely. I still find it hard to believe the Tigers would want to shop Curtis Granderson and Jackson, but business is business, I guess. Great points on how Tiger should have handled the whole car crash nightmare. The author is right: Just show up in person and everyone will quickly forget about the whole mess. Ex-track star Marion Jones might play in WNBA - Pleasant Dreams To quote: "What the hell is the NBA thinking?" Biting commentary on Monday's firing of Weis. Finally, some one else who doesn't understand why anyone would want to come to coach Notre Dame. 1) Vikings Super Bowl Victory - It will be a long time before the stars align for the purple and gold again. Brett Favre is having an MVP-caliber season and should be rewarded for his efforts. 2) Milwaukee Bucks Playoff Birth - Michael Redd is a shadow of his old self, but rookie point guard Brandon Jennings is living up to his hype. As long as front man Andrew Bogut can stay healthy, the Bucks have a shot in the weak Eastern Conference. 3) Chris Bosh to the Detroit Pistons (Free Agency 2010) - Bosh is a talented front-court man who would fit well with the Pistons' offense. He would be a good compliment to whoever Detroit decides to put at center, as Bosh would provide enough scoring punch for the both of them. 4) Keep Curtis Granderson a Detroit Tiger - He's MY Tiger, and I would like him to remain as such. The Tigers should hold onto him and let the contracts of Carlos Guillen, Jeremy Bonderman and Nate Robertson come of the books after this upcoming season. 5) Michigan State Spartans NCAA Basketball National Championship - They got to the finals last year and were just happy to be there against a far superior North Carolina team. An early loss to Florida doesn't help much for the confidence, but tonight's rematch against the Tarheels should say a lot about how the season will go. Since it's the holiday season, the sports gods should be in the mood for giving. Minus number four, I don't believe I'm asking for too much. Am I? We hope everyone had a great Thanksgiving. The holiday proved to be pretty good to both of us, although Cody's 12-4 finish resulted in him gaining yet another game on Matt (11-5). Once again this week we have a lot of differences. It should be fun! Reports from the Tiger Woods car crash have said the air bags in Woods' Cadillac Escalade did not deploy because the car was traveling at less than 33 mph. Assuming the tree Woods collided with was of moderate size, I would believe he must have been traveling at speeds much less than 33 mph if the air bags did not deploy. Grand Valley State University coach Chuck Martin won't call the NCAA Division 2 playoffs a revenge tour, but it is hard to believe otherwise. The story lines are just too perfect. GVSU rarely loses. Only twice in the past two seasons -- by a measly nine combined points -- have the Lakers been on the wrong side of the box score. This year, Hillsdale College became the first team since 2004 to defeat GVSU in the regular season. Ironically, the Chargers were also the first team to face Grand Valley's wrath this postseason. A 37-0 halftime lead for the Lakers last Saturday was plenty to reaffirm GVSU's dominance. Duluth stunned the Lakers in Allendale last season on their way to a national championship. Round two will feature much of the same talent. This Saturday, however, they will be facing a different Laker football team. Ever since the Hillsdale loss, GVSU has looked nearly unstoppable. The Lakers are hungry -- hungry for their first national title since 2006. Senior quarterback Brad Iciek is playing perhaps his best football of his college career. Running back trio Jimmy Berezik, P.T. Gates and Justin Sherrod are going strong. Receivers have stepped up through injuries. A young offensive line has gelled together. The defense has flexed its muscles. Danny Richard and Nick Lawrence have terrorized opposing lines (and quarterbacks). The linebacking core has been great. The patchwork defensive backfield has held its own through numerous injuries. Minnesota Duluth is a great team. However, this Saturday they will run into a dynasty eager to reassert themselves as the best Division 2 college football program in the country. The Cleveland Browns-Detroit Lions match up yielded one of the best finishes in the NFL this season. A Browns fan breaks down the shocking end to a meltdown by Cleveland. As the Boston Red Sox move closer to acquiring Adrian Beltre, this blogger wonders how Beltre compares to current Sox third baseman Mike Lowell. A nice collection of quotes from Florida Gators coach Urban Meyer. Hard to take anything he says seriously after reading these. The rantings of a Notre Dame football fan. We posted matching 12-4 records last week. Going into our own show bye week (Thanksgiving break), Cody holds a five game lead over Matt. I seem to find a lot of good stuff on New York Mets fan blogs, and this post is no exception. A funny and insightful take on the free agency season in baseball. One of many blogs about Henry's hand ball during France's World Cup qualifying match against Ireland. Read the comments. No matter how small of the blog, I couldn't find a single Henry story that didn't have comments. Goes to show how much soccer means to some in the world. Great statistical breakdown of the match up between two of the NFL's worst teams. All I can say is it takes a dedicated fan to do so much work for the Lions. For a blog dedicated to King James, I'm surprised how much this post bashes him. Regardless, the author makes several good points concerning James' attitudes. Will the success of Brandon Jennings lead more high school players to head overseas? Did the NBA 'punish' Jennings for doing so? A very nice read. First, I want to give a shout out to our contest winners from last weekend. For those who missed it, we posted a question to our Facebook fan page asking how many rushing yards Adrian Peterson would have against the Detroit Lions. Peterson went for 133 yards and two touchdowns on 18 carries. Surprisingly, we had two people who were nearly perfect in their predictions. The winner is Zach Kleinheksel. His guess of 132 yards was one shy of the correct answer. I have to give credit to Jason Thompson as well. Though he was two yards away with his guess of 135 yards, he correctly predicted Peterson would score two touchdowns. On to tonight's show, which will be our last for two weeks because of the Thanksgiving holiday. We're hoping for another good turnout to send us into break on a high note. As you can see, we have a full slate on our hands. Matt and I hope you can listen in! Tell your friends too! Interested in becoming an NFL offensive coordinator? The Cleveland Browns will be in need of one soon, and by the looks of it, their job requirements are pretty minimal. A hilarious satire of Allen Iverson's decision to terminate his contract with the Memphis Grizzlies after three games. "Israel, man, Israel. He was talkin' bout Israel. Not in the NBA, not in America. Israel." I find it a bit hard to believe that Bill Belichick was thinking about David Tyree when he made the decision to go for it on fourth-and-2 this past weekend. However, this column does bring up several good points concerning the faith Belichick has in his defense. Assuming the Detroit Tigers do deal Granderson, the Cubs are a likely destination for the fan-favorite centerfielder. Bullpen Brian thinks Granderson could blossom into an MVP while in Chicago. Another University of Michigan season has gone down the drain. BC Draft writes a nice breakdown of which college coaches, Rodriguez included, could be out of a job by the end of the year. The New York Knicks have publicly contemplated signing Allen Iverson. There is no other reason to sign the former NBA MVP, who lately has been more of a whiny cry baby than basketball player. Before the season, Iverson said he would use his year in Memphis to prove his critics wrong. Three unspectacular games and a terminated contact later, Iverson has instead proven nearly all of those critics right. His ego is just far too big to be coming off of the bench. 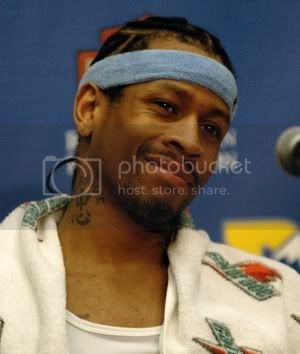 Even though he was averaging nearly 23 minutes a night for the Grizzlies, Iverson could not handle being a role player. "We talkin' about startin'. Not a bench player, but a starter. How silly is that?" Unfortunately, Iverson's 34-year-old, ball-hog point guard mentality is better suited to role player status, or even better, a spot off of the team. No longer is he an unstoppable scoring threat. He is certainly not the guy who averaged 33 points a game for the Philadelphia 76ers during the 2005-2006 season. Iverson's point totals are down. His assists are down. His age is up. All signs point to him being done. Do not tell him that. Iverson still thinks he is a star. Week ten was a tough week all-around. Cody came out on top of the ugly mess, gaining two games on Matt. We still look pretty sharp when compared to ESPN. Viral Video: Detroit Pistons Will Bynum: The next Spud Webb? This week's viral video features Detroit Pistons point guard Will Bynum. I'll let the video speak for itself. Sizing It Up is another new segment Matt and I will be publishing twice-weekly (for now). We're going to bring you interesting sports news and commentary from around the blogosphere and the Internet. I'm going to focus on finding lesser known sports blogs, but will definitely include anything I find to be relevant or interesting. If you see a story or blog post you like, please share it with us! We are nothing without our viewers/readers. Lambert's physical play has garnered herself and women's soccer national headlines for all the wrong reasons. Would we care if it was a guy? This blogger wants to forget all about it and focus on Carlee Payne (for good reason). As a Detroit Tigers fan, it's interesting to see how fans of teams like the Mets think. The argument for moving Wright, arguably the Mets' best player, is simply the hope they can play keep-away and stop Toronto ace Roy Halladay from ending up in crosstown pinstripes. This mock conversation between the Eagles' starting quarterback and head coach gave me a good laugh. "So, do we start our three game win streak this week, or tank one more on the left coast?" Who doesn't get mad? Seriously though, a nice article which features the most under appreciated part of basketball: defense. Another bonus is former Detroit Piston Lindsey Hunter being referenced in the story. It's Thursday again, so Matt and I are excited to get another show going tonight. As always, catch us live on here at 10 p.m. or shortly after. We SHOULD have all of the technical issues figured out. Although it's hard to believe, we only have a few shows left this semester! Help make them great by listening, talking in the chat room and sending us feedback. We have a few big show related announcements that we will be making live on air tonight during our last segment. We hope you get the chance to stop in and listen. Let's top 120 visits tonight! One of the new things we will be featuring on the blog from now on is a once weekly "viral video." Matt and I will scour video-sharing Web sites to provide you with a video we find interesting or newsworthy. We also have a big announcement to make regarding our show's future tomorrow on air. Please listen in to hear the big news! Looks like I'll be sporting the D. Wade jersey this week on air since my luck ran out this past weekend. A week after gaining a game on Matt with a mistake pick, he beat me fair and square. He finished with a 9-4 record, while I rolled in with an 8-5 mark. Once again, we were right in line with ESPN. Thanks to everyone who stuck with us through the audio lag last night. Assuming the little counter on the stream is correct, we hit about 114 people stopping in and out. Not bad. We appreciate all those listeners who have stuck with us! We fixed the audio issues about two minutes after the show was over yesterday, go figure. Next week we're hoping to go live without a hitch. Because of the terrible lag, I do not think we are going to put up a show highlight this week. Instead, Matt and I filmed a promotional video last night to replace the highlights. Naturally, the sound is perfect! We're shooting for such quality next week. For now, please tell you friends! Feel free to point anyone to the blog to see what we're capable of doing. Matt and I are looking forward to another great week on The Sunny and C Show. Tune in here at 10 p.m. to watch/listen. If we're aren't here right away, check back in a few. We have a show in front of us now and we had some technical difficulties last week so we were a little late. Looking forward to everyone watching tonight. Let's hit 80 this time! We were so close last week. So I'm really lucky after all. After accidentally picking the Panthers over the Cardinals, the Panthers went out and actually won! I wish I could do that more often. Of course, the helpless Lions lost to the previously-winless Rams. So there goes my happiness. All in all, we didn't do too bad. I finished 9-4 while Matt came in at 8-5. Only Mike Golic and Accuscore beat me this week. I haven't decided if Matt will have to wear something since he lost this week. It was a little unfair, but, as the adage goes, "I'd rather be lucky than good." Matt and I can't say thanks enough to everyone who listened tonight. We hit 79 unique viewers, one shy of my quite lofty goal of 80. Let's hit 200 next week! Haha. Show highlights will be posted by the end of the weekend hopefully. Are you ready for some radio?! Just imagine Hank Williams Jr. doing his best Monday Night Football introduction. Anyway, The Sunny and C Show will be live again tonight at 10 p.m. We will again create a post with the video feed embedded so you can watch us as Matt and I mill around like hamsters in the studio. We've also been officially "approved" to be on the air by the WCKS staff. So no more breaking rules for us. Let's hit 60 listeners tonight. The audio will be fixed, I promise. Lucky week seven was only average for us. Both Matt and I finished with matching 9-4 records. ESPN was about the same. As we tied, there will be no forced clothing for either of us this week. Thank goodness, I might have had to injure myself if I had a Dwayne Wade jersey on. Again, the audio is terrible. I'm sorry. We're still working out all the kinks. Thanks to all the people who stuck with our show throughout all the technical difficulties we had Thursday. Without going into too much detail, it was an issue of my (Cody) stupidity. Lots of things that I thought worked didn't, and after an hour of reflection I understand why. We're still getting our "show legs," but we'll be back better than ever next week without technical problems (I hope!). The microphones didn't play well with my netbook, so the audio of the show was poor. I apologize for that. We want to thank you all for you constructive criticism of last week's show. Matt and I have planned a few changes to make the show better this time around. The show will be broadcast live tonight (starting at 10 p.m. EST) on our USTREAM.tv stream and, hopefully, on the WCKS stream as well. The only difference is that the USTREAM page will have a video feed attached to it. There will be a post on the blog with the feed embedded so you can watch the show right here. I will have my computer in front of me this week, so feel free to contact us at anytime. While we're live, you can reach us at studio@thesunnyandcshow.com. Also, you can call the station line at 616-331-2875 (I will mention this several times). We will be introducing a segment tonight that I have dubbed "The Final Word." Basically, we're going to introduce a topic, talk about it, and then answer a final "big question." Expect each segment to run about 10 minutes with a song in between. So, if you can only catch the NFL picks, tune in at around 10:15 or so. These are only guidelines, so I could be completely wrong. We're looking forward to another good show tonight. See you then! Props go to Matt this week. His 11-3 record demolished my 8-6 showing and dismantled every single ESPN prediction. Hey, at least my record fell in line once again. I'm considering it a birthday present to Matt, as he turned 21 on Tuesday. No more going easy on him. The audio is off for most of the video because of terrible editing software. Sorry about that. Ok, so the stream is down, but Matt and I will be webcasting our first show from the booth anyways at 10 p.m.
You can watch it on our USTREAM.tv page, or I will be embedding the feed directly into a post on here. Either way, come watch, please! Well, the stream (which was supposedly up) is down, again, again. I'm still preparing for tonight's show, and Matt and I will probably make the trek over to the station tonight only to have our hopes dashed, again, again. That said, if we do get on in the near future, we've decided to webcast our show live on USTREAM.tv, a very cool free online-streaming Web site. We're going to leave the audio on as well, but I'm unsure how the sound quality will be. It's not like the video feed is going to be great anyway. Still, it's a cool feature, which I'll probably reference one too many times throughout our show. Some of you guys got a sneak preview of Matt and I playing Tiger Woods 2010 last weekend. Look for more random stuff like that as the year progresses. Here's hoping the station is fixed by tonight! Through the 1 p.m. games Sunday, both Matt and I were doing well. Unfortunately, the second half of the schedule was not so good. All things considered, Matt's 8-6 record and my 10-4 record weren't all that bad. ESPN was about the same. For those that are wondering, no, I do not hate ESPN. I just post their picks to make a point that just about anybody can be an analyst if you watch enough sports. Week six should be interesting. Lots of games that should be close.